I’m sure you’ll agree that having a reliable weather radio when bad weather hits is something you do not want to leave to chance. Features, functionalities and reliability, were our top criteria for selecting the best weather radio. If you want to get weather ready, MIDLAND weather radio scored high points in all categories and is our top pick for anyone looking for a quality weather radio. Weather has been more unpredictable than ever these last few years with blizzards, thunderstorms, large amounts of snowfall and floods occurring more often. Having a reliable weather radio can provide your family with some peace of mind and give you the information you need to keep up to date with any weather disasters in your area, especially when there is a power outage in your area. Weather radios come in all styles and have different features and capabilities depending on the model you are looking at. When you’re looking for something to fit specific needs, it’s important to do your research and compare models against each other to see which one fulfills the needs and wants you have. We’ve reviewed the top rated weather radios below so you can see if any of them appeal to you. Before you buy, make sure you understand a little bit about weather radios and what they do, how they work and the kind of information you can get from them. The kind of power supply they take and operating ease are also things to look at. Once you have all this information you are ready to choose and buy the one that provides the features and capabilities you want. 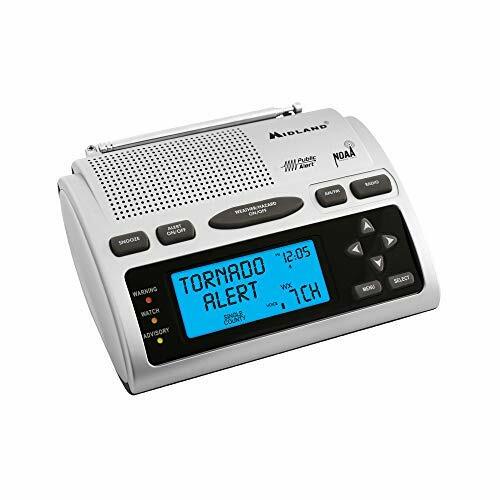 You will be able to stay updated on the weather conditions that affect you with this Midland WR-300 all-hazard/weather alert radio. It is designed with S.A.M.E technology which stands for Specific Area Message Encoding. This allows the weather radio to be pre-programmed to receive the warnings that are specific to your local area. You can input your state, county and any counties nearby as well. You have access to 23 programmable county codes, AM.FM tuning, date, time, alarm function and it switches on its own from AM/FM to any alerts coming through that are pertinent to your area. It has a single speaker. You can power the weather radio with the AC power cord that comes with it or you can use 4 AA batteries as well. These will need to be included. The alerts are easy to read on the blue, backlit LCD. It also has a 10-alert memory that you can add, edit and remove information from anytime you want. All of your alert needs are covered with this compact and thorough weather radio. Just a few of the helpful features that this radio has include an alarm clock, full calendar display, over 60 emergency alerts, continuous backlight option, loud alert capability so you hear it go off at all times, color coded alert level indicator and much more. You will be able to stay up to date on all of the latest hazard, weather and civil emergencies going on in your area with this great little weather radio from Midland. These channels receive emergency advisories in such disasters as floods, thunderstorms, civil danger warnings and tornadoes. If you live in a high-risk weather area, and you’re on the go, then you’ll going to want to have this weather radio. Because the NOAA covers 93% of the United States, your area can be covered almost anywhere in the US you live. This functional weather radio can be programmed to receive only the alerts you want to receive about your local area or the areas you choose. It eliminates any alerts from other areas that don’t pertain to you so you can rest assured that when the alerts go off, you need to listen to what is being said. 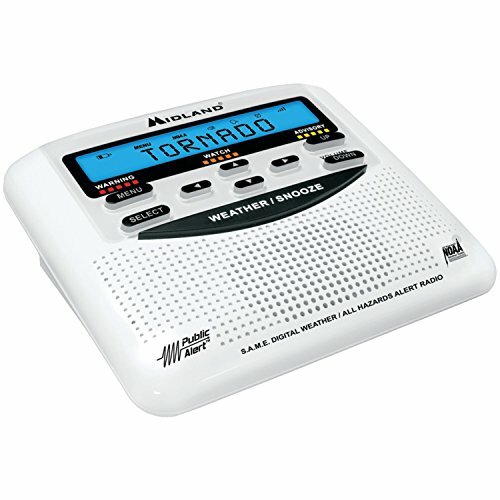 The Midland HH54VP Portable Weather Alert radio has 3 alert options (tone, voice, visual) for emergencies. This useful weather radio also uses Weather Scan to find the strongest NOAA broadcast and can store up to 9 country codes. The Midland WR-120C weather radio can keep you up to date on weather, hazard and civil emergencies easily so you have peace of mind that you will always be prepared and know what is going on in your area. You can get alerts in English, French and Spanish and covers alerts about floods, tornadoes, thunderstorms and many other alerts. Having a reliable weather radio like this means more peace of mind for your family. There are three alert tones to choose from: flashing LED light, a voice alert and a 90 dB siren that can be heard all over the house with ease. Programming is easy as well. Add up to 25 counties to follow and customize the alerts for what you want to be alerted to. No need to get alerts for areas that don’t pertain to you. You can power this weather radio with the included AC power cord or get 3 AA batteries and have a battery backup for when the power goes out or you are outside and want the radio with you. It also has AM.FM capability and will switch automatically from the radio to the alerts when there is something to know about. You also have a convenient alarm clock with snooze button, an external antenna and alert jack as well. It is a great choice for anyone who wants an easy to use weather radio that has all the needs covered. Knowing what is going on weather, hazard and civil emergency-wise is very important so you can keep your family safe in all conditions. The top rated weather radios we’ve reviewed are all easy to use and provide a lot of features for the user that enable them to customize their radio to fit their needs from the alerts that they get to the counties that they get them for. All have battery backups which is very important when the power goes out. Below we have put together a buyer’s guide that will give you even more knowledge and information about weather radios and how they can be used to keep you up to date on what is going on in your area. Once you have read this guide you will have the information you need to begin your research. You may have heard people talk about a weather radio but do you know what it is and what it’s for? A weather radio is a special radio that receives emergency alerts for many different things. Included in these situations are weather emergencies, natural disasters and even situations like terrorist threats. The network that sends these alerts to weather radios is operated by the NOAA or National Oceanic and Atmospheric Administration. Because this is where the alerts come from you may hear weather radios being referred to as NOAA weather radios. With a weather alert radio like the top rated ones we’ve reviewed above, the radio is silent until an alert is detected and then it will go off, alerting the user that there is something to report. The benefits to having a weather radio are numerous. Most models have battery backups and work even when the power goes off. This is when you need that radio the most is when you don’t have another power source. Regular radios have updates when something is going on, but a weather radio will give you a lot more information and more frequently as well since that is what they are designed for. Knowing what is going on weather wise is very important especially since our weather has been so sporadic the last several years. Huge snowstorms, major floods, blizzard conditions and more have been becoming the norm rather than a rarity and these weather conditions can cause dangerous situations for people. Having a weather radio to alert you to what is going on means that you and your family will be safer and not taken by surprise. Another benefit to having a weather radio is that you can find out what is going on during the disaster or storm as well even if the power is off. These updates can help you know when it is safe to venture out. Weather alert radios come with a lot of features that make them easy to program specifically for your needs. There are some features that tend to be the most commonly found on most weather radios. We’ve outlined them below. Alerts – A weather radio is no good without a good alert system. The alert feature enables the radio to come on when there is an alert to notify the user about. Once the alert has been detected, the radio comes on and whatever type of notification you have chosen will sound. Most common is either the voice alert or the siren alert. There are many that have flashing lights but this is easily missed and not recommended as the main alert sound used. The most popular sound used is the siren because it is unmistakable and usually very loud so no matter where you are in your home it can be heard. S.A.M.E Technology – S.A.M.E. stands for Specific Area Message Encoding. What this means is that your radio can be programmed to only receive the warnings for the county or counties you specify rather than for everything going on everywhere the weather radio station reaches with its broadcasts. The benefit to this is that when you hear that alert go off, you will know that it is about your area. Power Options – There are several different means of power that weather radios can be operated with. Most have one main source of power, which is an AC power adaptor and is the best choice for long term use, but most have an additional means of power should there ever be a power outage. Those additional, backup methods include hand crank generators, solar panels and batteries. Portability – If you want the weather radio to be on all the time but stay silent until there is an emergency alert, you have a lot to choose from. These radios are most commonly used in offices, homes, schools and businesses and are usually placed on a desk. They are most often plugged in with an AC adaptor and has a battery backup in case the power goes off. Portable weather radios are great for taking on camping trips, hiking and other outdoor activities. They are general small and lightweight and fit into backpacks easily. Mobile Device Charging – Some weather radios have the ability to charge a cell phone from the radio itself which is very helpful in the event of a power outage which knocks out most cordless landline phones so you have a means of communicating should the need arise. Lights – Some weather radios have flashing LED lights as one of the alert choices they offer. Others may have the ability to be used as a flashing beacon to alert others of your whereabouts. Alarm Clock w/ Snooze – A handy feature that some weather radios offer is an alarm clock with a snooze alarm. This is very handy if you need to still wake up at a certain time for work despite having a power outage. “Public Alert” and/or “NOAA All Hazards” Logo – These two standards were developed with input by both the NOAA and the NWS. The public alert sticker means that the weather radio you are considering has been tested and checked to make sure it meets certain technical standards including receiving area specific alerts, hearing a tone before the alert comes through and that they have lights and other special services for the hearing impaired or visually impaired. When doing your research, having your weather radio with one or both of these logos is very important. Weather radios have grown in popularity so much that it is becoming a lot more common to find them in homes and businesses. Schools almost always have them and for good reason. They are crucial for staying abreast of important weather situations, natural disasters and other things that people don’t want to be caught off guard by. With all of the models available, finding one that fits your family’s needs is guaranteed, especially since you now have some important information on what they are for and what they alert you to. There are some weather radios that have a lot of extra capabilities and features but if you are not going to use them, you don’t need to purchase a radio that has tons of bells and whistles. Before you start shopping think about what you need from your weather radio and what capabilities you want it to possess. Some features are much more important than others like the ability to charge a cell phone and also act as a flashlight. Whatever features you choose, you will be able to take your newfound knowledge and choose a weather radio that will provide all you need. Some users even get two; a stationary one for putting on the desk or counter and a portable one for hiking, camping, boating and other outdoor activities where a smaller radio is much easier to carry. They provide a lot of peace of mind in the event of an emergency and do a lot to keep users feeling connected to what is going on.